Arts integration is an approach to learning in which students construct and demonstrate understanding through art. Together with our campus Dual Language program, which provides students the opportunity to engage multi-language curriculum, students experience the creative process in a way that meets their own unique cultural, social, emotional and intellectual needs. Parent Right to Know letter. Outside the main office before school and the walker dismissal area after school on the last Friday of the month that is a school day. We are happy to announce that we will be continuing this partnership in the 2018-19 school year! A+ Federal Credit Union has partnered up with Wells Branch Elementary to help students save! that will give your child money in his/her own Green Apple Savings account! See flyers sent home for more details.  Wells Branch Elementary Arts Integration Academy is a Round Rock ISD public school of choice. We welcome Round Rock ISD student transfer requests to our campus for innovative programming such as arts integration and dual language. Reminder: Student transfer applications are required annually. A new student transfer application for 2018-2019 must be submitted for all students currently attending WBE AIA as transfer students. Student transfers to elementary schools listed as “open” will be approved on a space available basis and if expectations for student behavior, attendance and academies have been met. Should a grade level or program be near capacity, the student transfer may be denied. A “closed” elementary school may still accept transfers of employee’s children if it does not cause the grade level or program to meet capacity. Student transfers to any campus will only be approved if the additional student would not result in additional staffing or facility needs at the receiving campus. Student transfer applications must be submitted by the parent or guardian and reviewed by Round Rock ISD annually. Approvals for continuation are not guaranteed year to year. Please take this into consideration when applying for a student transfer. Children have the unique opportunity to explore earth sciences in an outdoor laboratory with the WBE AIA garden program. We need volunteers to lead a garden class. Garden classes are 30 minutes long within the designated science schedule . Dianna Gielstra is one of our Garden Teachers. Dianna will be happy to lead your first classes, and show you how to lead garden classes for any grade level. We use the Junior Master Garden Curriculum, which is easy to follow. Please contact Dianna (dlalsup@yahoo.com, 512-422-1943) with an email or a text with the following information: Name, phone number and email, child’s teacher, and days/times available. This program would not exist without the support of all of you!!! This year you can fill out the volunteer form and return it to the office or email. If you would like to work with our students, don’t forget to fill out the district volunteer registration online form. Dual Language Programs are those where students are taught literacy and content in two languages. The RRISD Dual Language Program goals are the same for both native English speakers and native Spanish speakers. In the dual language program, the focus is to transfer language skills to develop bi-literacy and not to transition into one language instruction. In this way, all students become bi-literate, bi-cultural and bilingual. All students are instructed in Spanish in the primary grades and transition into Spanish and English in the later grades. Students in Pre-K and Kindergarten receive 90% of their daily instruction in Spanish and 10% in English. Each year, students will receive more instruction in English as the percentage of Spanish instruction time begins to decrease. By 4th and 5th grade students will receive 50% of their daily instruction in both English and Spanish. WBE AIA would like to give a special thank you to all our students, parents, faculty, and staff for helping us become a Capturing Kids Hearts Showcase School again in the 2018-19 school year! 2019 Career Day Thank You!